April 4, 2018 - With the completion of two additional 100Gbps “points of presence,” LSST now has a redundant, high-speed, fiber-optic network between Santiago, Chile, and Miami, Florida. This is the international portion of the network for transferring data from the summit of Cerro Pachón to the National Center for Supercomputing Applications (NCSA) at the University of Illinois, some 8000 kilometers (nearly 5000 miles) away. 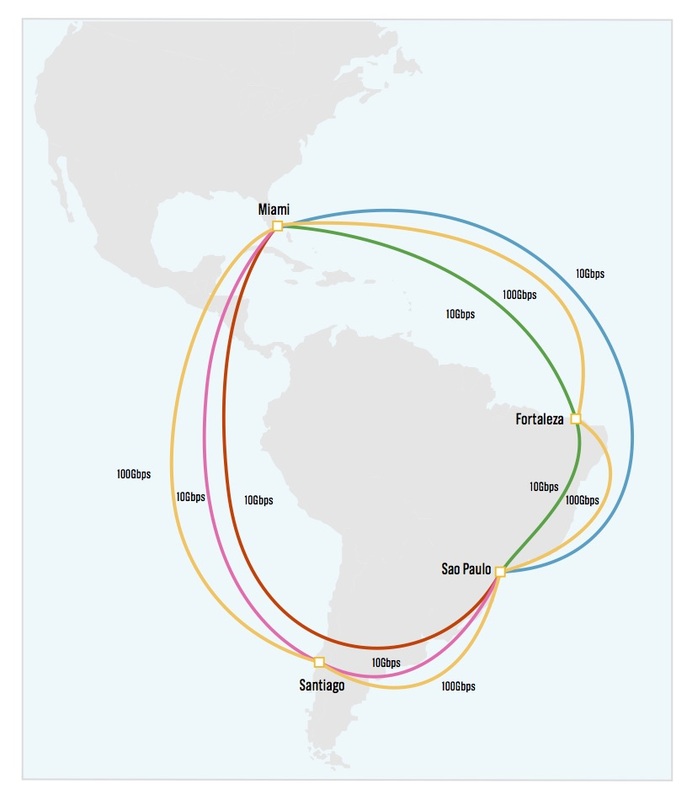 The additional connectivity in Santiago, Chile, and Fortaleza, Brazil, was installed in late February and early March, 2018, and completed the ring shown in yellow in the accompanying figure. Jeffrey Kantor, of the LSST Project Management Office, said, “This development will enable LSST to realize a reliable, high-speed network connecting LSST sites in Chile and the United States. This network will permit LSST data to travel in seconds to our LSST Data Facility at NCSA where it will be processed into scientific data products including real-time alerts of transient events, calibrated images, and catalogs ultimately containing billions of galaxies and stars.” The network links are provided as part of the NSF IRNC: Backbone AmLight Express and Protect (ExP) project and the AmLight Consortium: a group of not-for-profit universities, state, national, and regional research and education networks including the AmLight ExP project at Florida International University, AURA, LSST, RNP, ANSP, Clara, REUNA, FLR, AURA, Telecom Italia Sparkle, Internet2.